Cindis World: The best birthday present ever! For some reason, the number 45 is bugging me...never before has a birthday gotten to me, at all. Not even the big 4 0 . But, every time I say it, 45 is just not getting it, lol. One thing I noticed yesterday, when I fill out survey type questions and they ask the age group I am in....my group ended with 44, which means as of today, I have to check the next age group....also, I don't FEEL like I am halfway to 50. This may all sound weird to anyone reading it, but I thought by now I would BE my age....and I am not sure what BEING 45 is, but its not ME! Ok, I'll deal with 45, as long as it means I get to have this precious li'l priss in my life. I love you Chelsea, and thank you for blessing me with this perfect angel. May this new year in your life bring many good and unexpected blessings to you and your family. AWWWWW!!! 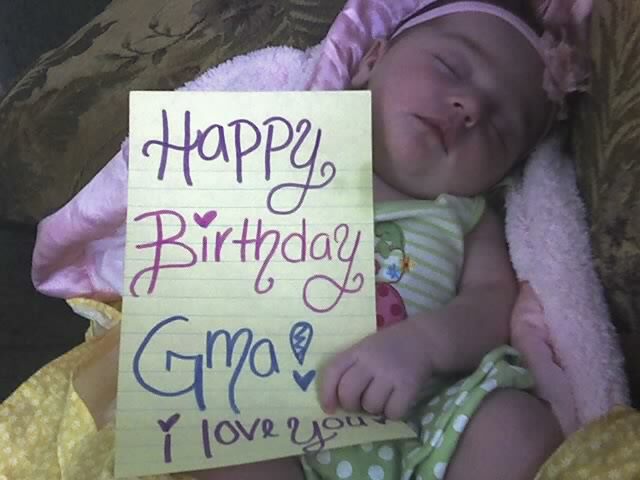 What a precious birthday gift! Li'l Priss is looking as beautiful as ever! Love the updates and pictures!!! AWWWWW>>>THIS IS SOO DANG CUTE!!! HAPPY BDAY CINDI!!! WE LOVE U!! Happy Birthday!!!! 45 is the new 25. She is just too adorable. She already looks so grown up in her cute outfit.